A new interview with Ronald D. Moore from Deadline Hollywood has him answering questions about the Outlander season three finale, season four, the possible season five, and the possibility of Tobias Menzies returning for flashbacks. Below are excerpts from the interview, but head over to Deadline Hollywood to read it all. DEADLINE: Speaking of the books, following the trajectory of past seasons, Season 4 will obviously draw a lot from Drums of Autumn. How much of a shift away or tweaks from the book can we expect to see in next year’s Season 4 – which you teased at the end of the Season 3 finale? MOORE: I’ll say, we’ve continued to do that. You know we always start with the book structure and order of scenes, and then figure out what works best for the dramatic series. We continue to do that in Season 4 for sure. There’s departures from the book, and we embroidered certain storylines in different ways. We’ve probably re-sequenced the order of certain events in that book, changed some storylines here and there. I wouldn’t say it’s anything radical, you know. I think readers of the book who still love the book will definitely recognize the story and the characters, and the general shape of the season is definitely the shape of the book as well. DEADLINE: Are we going to see Diana write any episodes in season four? MOORE: Nope. Not this season. She’s been pretty busy writing her ninth book. So she’s doing a lot of writing, but just not for us. DEADLINE: What about a Season 5 renewal? You got a Season 3 and Season 4 pick-up at the same time last time, so should we expect the same soon here? MOORE: (laughs) I hope so. Yeah, there’s definitely talks between Sony and Starz. You know, there’s always a lot of negotiations around various renewals, but yeah I feel pretty confident we’re going to get it. I don’t know when it would be official, or you know what their order pattern is, or any of that kind of stuff. But yeah I’m not sweating it. Just put it that way. DEADLINE: On that topic of not going back, early in Season 3, Tobias Menzies’ Frank Randall character, the slightly nicer one of his two roles on the show, died in a car crash. Is that really the end for the 2015 Golden Globes Best Supporting Actor nominee on Outlander or is Tobias coming back somehow for Season 4? MOORE: (laughs) I think there’s a strong possibility we’re going to do that. We’ve been talking about doing some way of getting Tobias back in the show in Season 4, at least for some flashbacks, or some other kinds of sequences. So nothing’s been committed yet, but yeah that’s on the table. 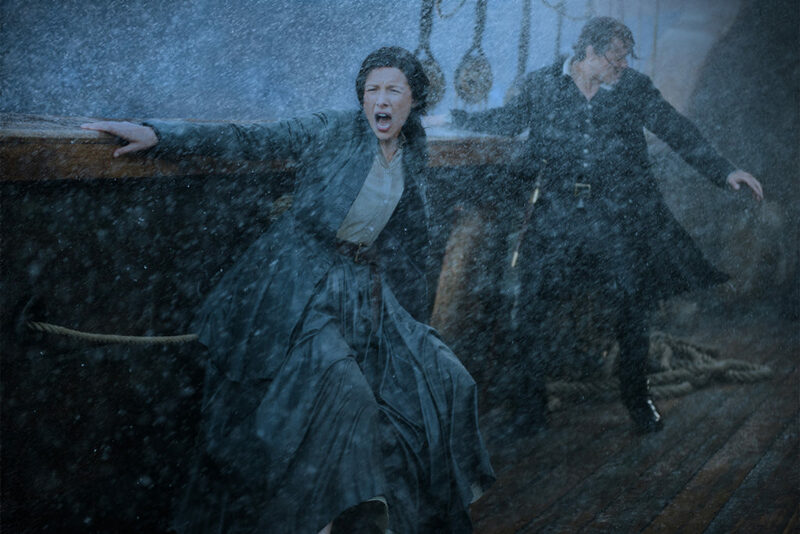 DEADLINE: There was an epic sense to the Outlander Season 3 finale, so I wonder – was fun and interesting the terms you’d use to describe it in retrospective and how does it rate for you among all the season finales you’ve done over the years? MOORE: No two ways about it, this was a very difficult one. It was one we had to plan well in advance because we knew there was so much crammed into it. It does cover a lot of ground. The hurricane sequence alone was months in the planning and execution. We had to do it in South Africa, which was very far away from our base of operations. Doing stuff with water is always tricky and ships, and they were the Black Sails’ sets. So overall, just logistically, it was probably one of the most difficult finales I’ve probably ever done because it was covering so many different bases. There’s an emotional piece, an action piece, some mysteries, and big mythology, and then arrivals in a completely new locations, and all that. This entry was posted in Interviews, Production News, Ronald D. Moore, Tobias Menzies and tagged Interviews, Ronald D. Moore, Season Five, Season Four, Season Three, Tobias Menzies by Sarah Ksiazek. Bookmark the permalink.